» British Tea and the Proper Wielding of Teapots. 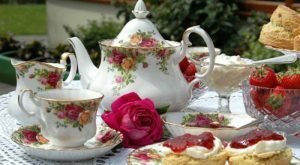 I want to try to clarify some of the rules bout the ritual of tea time as it is probably one of the most misrepresented of British traditions. Whenever I need information on the strangely intricate and unbending conventions that surround the Edwardians and their eating habits I consult Mrs. Thwaite, the cook at Iyntwood, and she sets me straight about the “right” sort tea, as served to Lord and Lady Montfort, and the “other” sorts of tea –enjoyed by everyone else! The epitomy of conscious refinement -do notice that the little finger of her right hand holding the cup is raised! The custom originated amongst the privileged classes in England in the 1840s. The Duchess of Bedford was staying with the Duchess of Rutland at Belvoir Castle and they came up with the idea of eating something conveniently small and delicious with a cup of China tea at about 5pm to tide them over until their twelve-course dinner at 9pm. 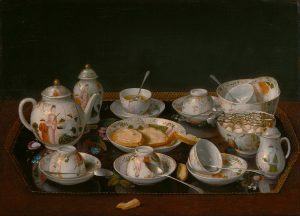 By the end of the 1800s afternoon tea had become part of the British way of life, and what you ate and drank depended on whether you were from the land-owning, professional or laboring classes. A rather 21st century take on finger sandwiches -but they look really delicious. For the uppers tea was a wonderful opportunity to show off one’s aristocratic Georgian silver and fine English bone china. It was made by the lady of the house in the drawing room or the library for her family and guests. 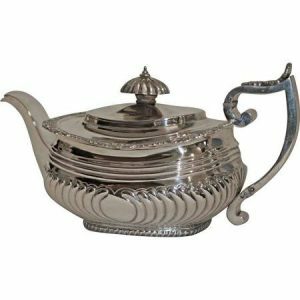 Silver kettles of simmering hot water, sterling teapots with ebony handles, caddies of the finest China tea, sugar tongs for sugar lumps and little jugs of creamy milk were all part of the ritual of making tea. And as in the way of everything the necessary equipment grew and grew and grew. Bun-warmers have appeared on many a 1930 household inventory. 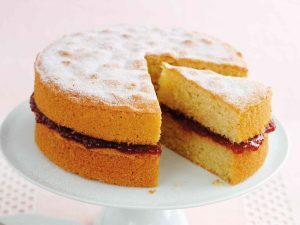 A true Victoria sponge was sandwiched only with strawberry or raspberry jam -never with cream and jam! Trays of delicious and delicate food were dotted about the room so everyone could wander about as they sipped their tea, and chatted. What did they eat? 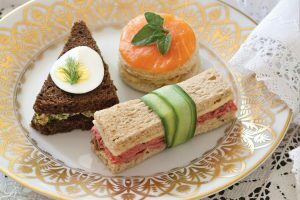 Delicate crustless, two-bite sandwiches made with butter and filled with smoked salmon, or finely chopped egg and cress, and sometimes just thin slices of cucumber; small plain scones, cream and jam; a Victoria sponge or an iced Dundee fruit cake. And that’s it! 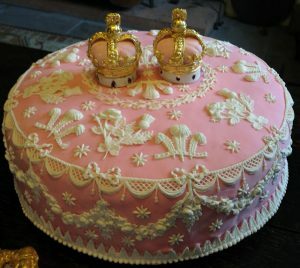 A Prince of Wales cake — displaying the representative three feathers. This was a rich fruit cake, covered with a sheet of marzipan and then iced. Pure heaven! And then came the snobberies! The us-and-them of tea time. 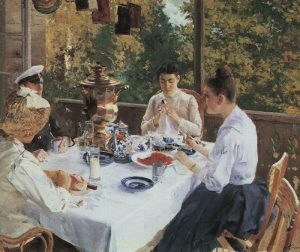 Afternoon tea for the aristos was not a gargantuan spread of fancy cakes and trifle, four layers of chocolate cake and all sorts other delicious things because they were going to be picking through at least eight courses later in the day. But for the middle classes tea was an opportunity to go wild! What was known as a good spread knew no limits to baked confections and complicated sandwiches. 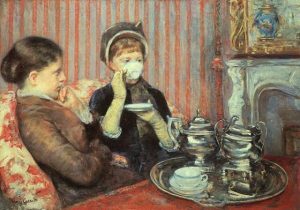 By the end of the nineteenth century, afternoon tea in its various forms was enjoyed across the British Isles and had also become a classic social marker. 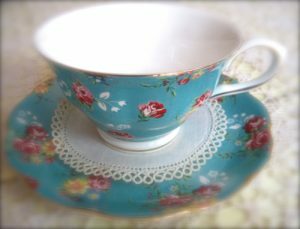 Putting the milk into the teacup first and then pouring tea in next was lamentably middle class, and the use of lace doilies, overly ornate china and little serviettes were exclusively used by the aspiring classes. The doily! There were doilies for and on everything, cake stands, the backs of chairs. The ultra-refinement of being ‘refined’. 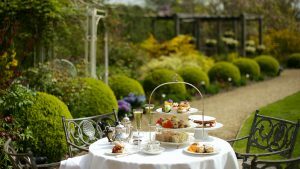 A solicitor’s wife seated in the drawing room or garden of her brand new Edwardian villa in Tunbridge Wells, her maid in attendance, dispensed a splendidly lavish tea to her friends to impress. At least four kinds of tiny sandwiches, dainty iced-tea cakes, brandy snaps filled with cream, meringues, little dishes of trifle, and if there were gentleman present, anchovy toast or something hot and peppery called Gentleman’s Relish! Butter me a crumpet! this is where I like to have my tea –in a garden. Surrounded by herbaceous flower beds, an immaculate lawn, shady trees and birdsong. The working-classes on the other hand ate their tea somewhere between 5 and 7pm and often referred to it as meat tea. It was so substantial they sat down for it and ate it with a knife and fork. The good old sturdy and dependable Brown Betty. 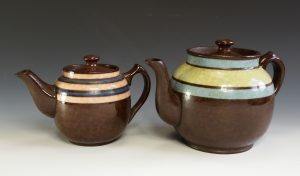 These durable pots make excellent cups of strong, black tea. The darker the better! Protein packed and usually featuring something splendid with potatoes, this was the sort of tea to put you right at the end of a long hard day of physical labor. Shepherds pie, or perhaps sausage and mash and then stewed fruit with custard and cake, or if times were hard lots of bread, butter and jam to fill you up. Tea was the last meal of the day. 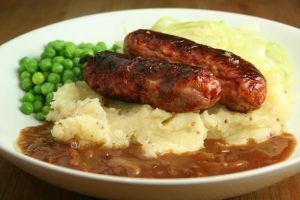 Nothing in the world quite like pork sausages made in the Yorkshire Dales, with masses of buttery mash. 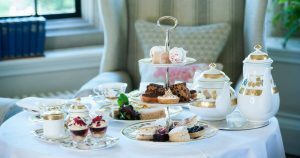 High tea was usually eaten by everyone except the upper-classes and usually on Sundays and again was substantial and worth sitting down for. Cold ham and pickles, cold roast beef and pickles, salads and at least three kinds of cake and if there was an occasion to celebrate a trifle, or jelly. High tea — a truly depressing end to Sunday with the aunts, uncles and cousins. 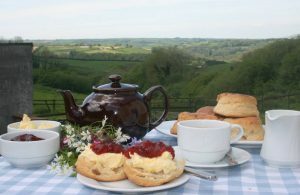 And then there is the all confusing cream tea which originated in the west of England and was considered something of a treat at the end of a day out atthe seaside or an afternoon’s drive in the country. A Cream Tea always includes scones served with clotted cream and strawberry jam. Highly ornate china and I think that is whipped cream. Clotted cream is the key to authenticity here: unsweetened (that’s what the strawberry jam is for) thick (clotted) and a rich buttery yellow. Clotted cream ONLY comes from Devon or Cornwall, fresh from cows that graze thigh deep in pastures of emerald green grass, the product of countless rainy English summer days. If you can manage to eat only a quarter of that heavily laden scone I promise you it will keep you going until breakfast the next day!